...impaired recreational opportunities and fouling of a drinking water source. Did you know that the number one pollutant in Maine's rivers, streams, brooks, ponds and wetlands is soil from nearby eroding sites? Whenever mineral soil is exposed, loss or movement of that soil is possible from the actions of rain, snowmelt or wind. 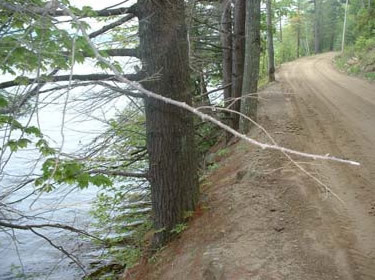 All land is located in a watershed with most runoff reaching a stream, river, lake or coastal water. 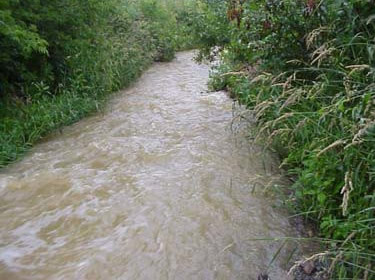 Eroded soils and other pollutants can be transported and deposited into these resources resulting in damage to fish habitat in streams and movement of pollutants, such as phosphorus, to lakes. 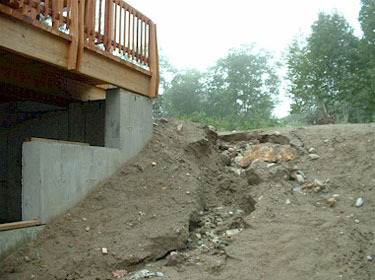 DEP uses the Erosion and Sedimentation Control Law to support education efforts concerning the importance of erosion control and promote the use of best management practices (BMPs) in watersheds, both within and beyond immediate shoreland areas. The Nonpoint Source Training Center provides training to become certified by the Department in understanding and implementing effective erosion control. See the Training Schedule for future training opportunities. Anyone filling, displacing or exposing soil or other earthen materials, must take measures to prevent unreasonable erosion of soil or sediment beyond the project site or into a protected natural resource, such as a river, stream, brook, lake, pond, or wetland. While no permit is required, erosion control measures must be installed before the activity begins, be maintained, and remain in place and functional until the site is permanently stabilized. Sediment control measures, such as silt fence or hay bales, placed at the down gradient side of the construction site before work begins. Erosion control measures, such as mulch and vegetation, placed as soon as feasible to permanently stabilize the site when construction is completed. Agricultural fields are exempt, and forest management activities conducted in accordance with Maine Land Use Planning Commission standards are considered in compliance. The law is enforceable by both the DEP and certain municipal code enforcement officers. Washouts in areas downgradient from any point of concentrated stormwater runoff. Contractors certified by DEP in erosion and sediment control practices.